I can typically detect when my life is out of balance. Usually, my body lets me know first. My brain slows down and I start doing things like showing up at the gym with only one tennis shoe. My right eyelid starts doing a strange twitching/fluttering thing. I start waking up at 4 a.m. every single morning for no apparent reason. Basically, my body spares no time in announcing that something is off and I need to be rebalanced. You don’t need to be a new-age guru to know that balance is central to living a healthy life. 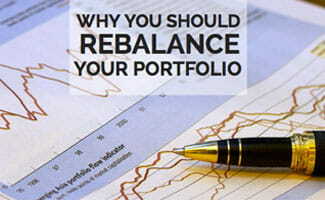 In much the same way, a portfolio needs to be balanced (in an allocation that is suitable for you); however, our portfolios are not as quick as our bodies to announce their lack of equilibrium. Often times, the lack of balance may initially look like a positive thing when we review our monthly statements. “Wow, the stock market is really up this month!” you may remark. “Things are going well with my investments. No need to change anything now. I want this to continue!” When things are going well, we don’t feel compelled to make any changes. The important thing to remember, however, is that when there is significant movement in the stock market (in either direction), it may be time for a little portfolio rebalancing. Imagine that you have an asset allocation that is 60% equities and 40% fixed income, based on most financial advisor’s recommendation. Below, you can see a chart that shows an example of what would have happened if you had started out with this allocation at the beginning of 2003 and did not rebalance your allocations at all through the end of 2007. As you can see, by the end of 2007, your allocation would have been significantly heavier in stocks than when you had started, with approximately 69% in equities and 31% in fixed income. Now, think about what happened in 2008. In this hypothetical example, you would have had a more aggressive portfolio than you intended and would have experienced a more substantial decline in your overall portfolio value than if you had rebalanced back to your original weightings of 60%/40%. This is an excellent example of what happened to many people who did not actively rebalance their portfolios and evaluate their risk tolerance on an annual basis.